This week I have been posting things related to the month of October and I will stick to a theme this Friday as well. 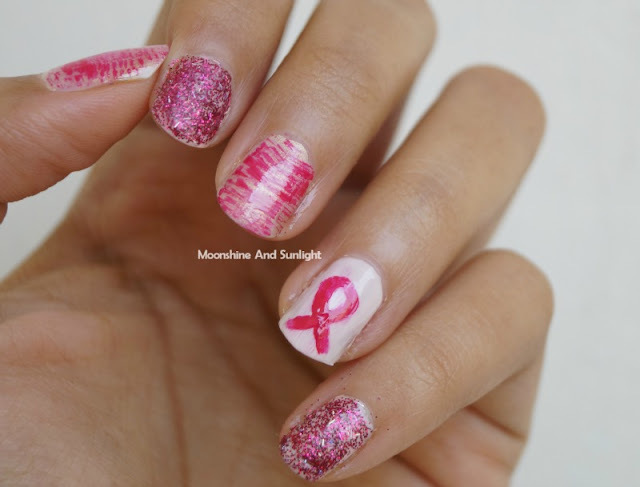 I kept a pink nail art for Wednesday and a pink nail art in October because I would love to create awareness about October being the breast cancer awareness month. I have lost a lot of close people to this disease and I would take this blog post as a simple way of making more people aware of this month's significance. Breast cancer is mostly common in Women, but there is a significant number in case of Men too. Please make sure you keep checking for any lumps regularly, it is a very easy process. Do check out the numerous tutorials available on the internet. I have used Avon Pearly White and Maybelline Cotton Candy as the base.The ribbon on my ring finger is drawn using Avon simply pretty Wild Berry and the glitter topper is Essence That's my pop cake! . The dry brushing on pearly white is done using a fan brush with two polishes, Streetwear Be mine and Avon Wild berry. 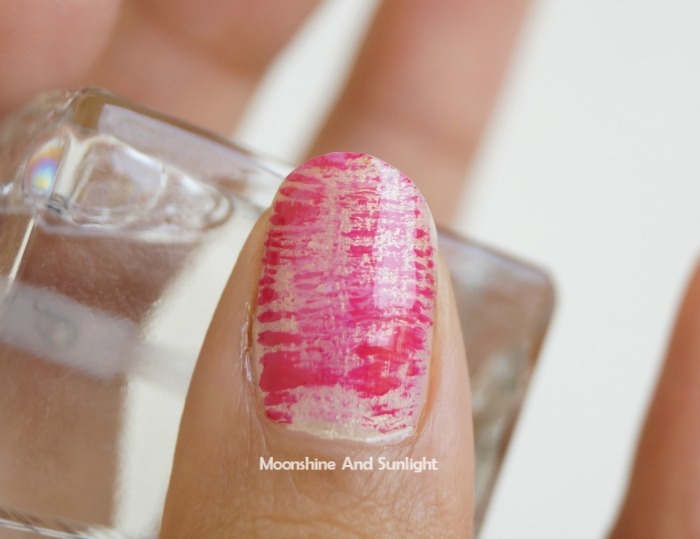 To finish off the nail art , I have used the top coat from LYN nail polishes. 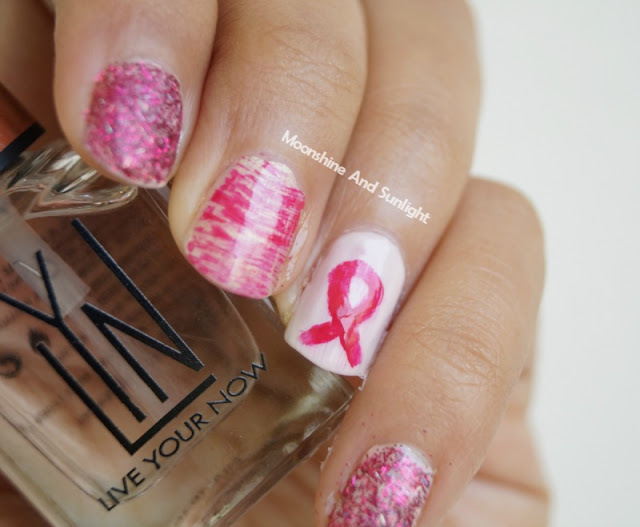 I tried to keep the nail art simple and spread the message. I know a few people who did not know that this month is Breast cancer awareness month. 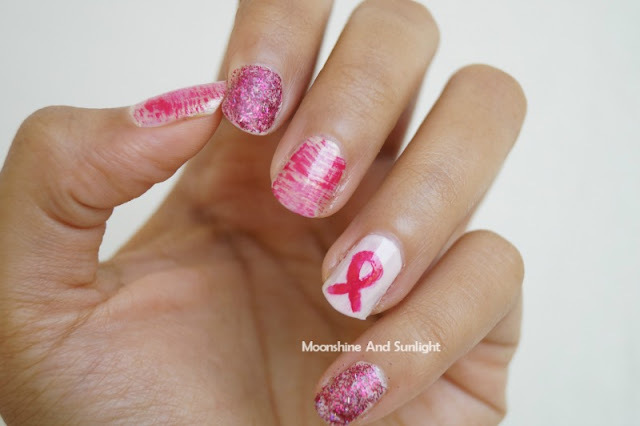 So don your pink ribbon and support and spread the information because Knowledge is power, isn’t it ? ?